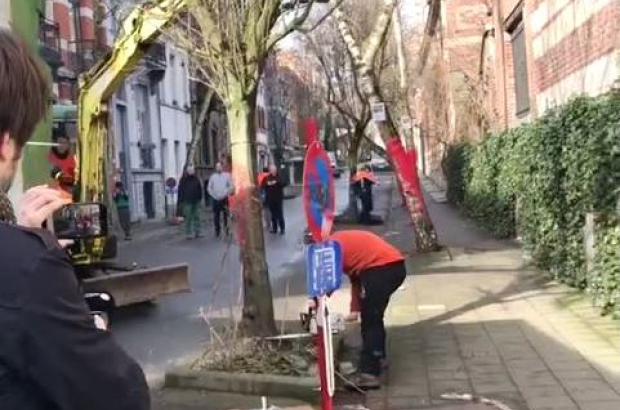 Despite a month-long protest by residents, 51 healthy birch trees are being cut down on Rue Berkendael in Forest. The trees must go due to works in the street carried out by the Vivaqua water utility. According to Forest authorities, the root systems are also responsible for some damage to front stoops on the street, which runs between Albert and Brugmann avenues. The name of the street – Berkendael – literally means Birch Valley. The Brugmann-Berkendael-Albert neighbourhood committee has been arguing since last year that the works could be carried out without felling the trees. The municipality disagreed but promised to plant 38 new trees on the street at some point in the future. These trees will not be around long enough to make it onto a new website: Wood Wide Web collects information on 120 of Brussels’ largest, oldest or otherwise most unique trees. Launched by creative agency 32shoot, the site maintains a virtual map, searchable by kind of tree, that tells you where the tree is located and why it was chosen. Some of the trees are smack dab in the city, beloved by neighbourhood residents, while others are in parks or on the edge of town, bordered by grazing cattle on one side and construction works on the other.